With TODAY the 50 days until Christmas mark - I freaked out a little!! 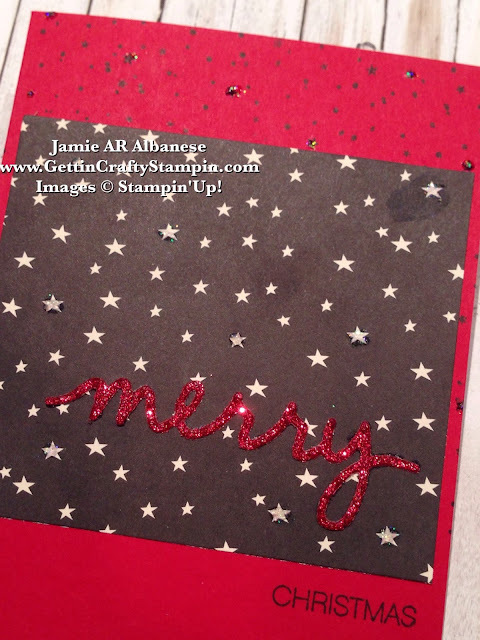 So here is a fun and easy Merry Christmas hand-crafted card that celebrates with sparkles and a starry night. 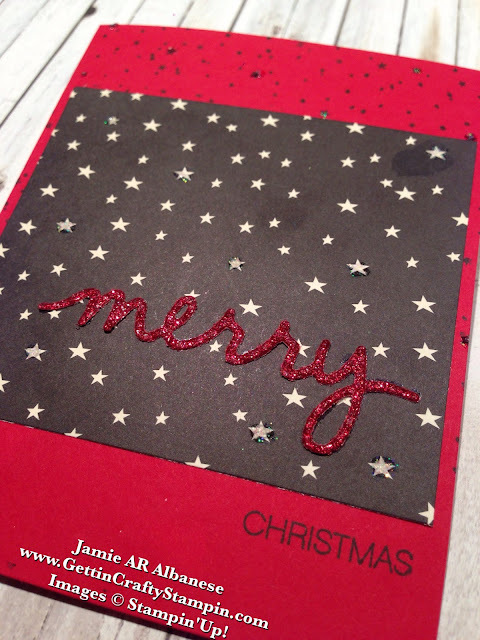 Using my left-over Halloween Happy Haunting Designer Series Paper in this pretty Christmas card. 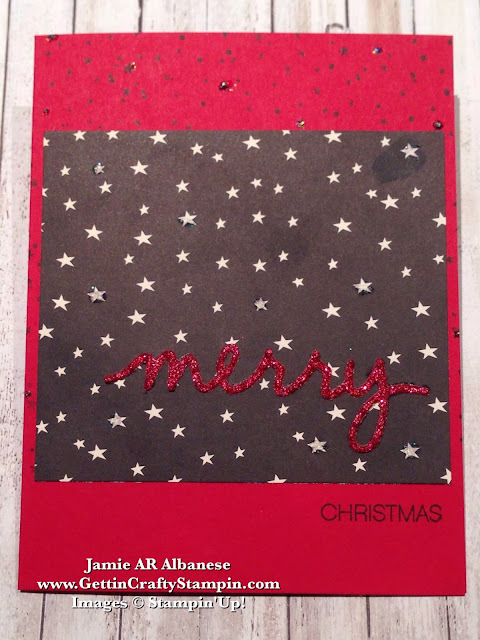 Join Us at upcoming card making classes and have your holiday cards before the Christmas rush! When your pretty paper is a great deal... our pretty Designer Series Paper is awesome! It is double sided with color coordinated pages, they are great! Here using the Halloween Happy Haunted Desinger Series Paper (that I didn't use during the Fall) to create a Christmas card is ideal on my budget. Such pretty paper, it is no hardship to create a fun holiday card. I love a good deal! Here a stunning stamp set that is great on it's own is bundled (saving you 15% when you purchase the two together!!) with a great Christmas Collection of Thinlits Words Dies! 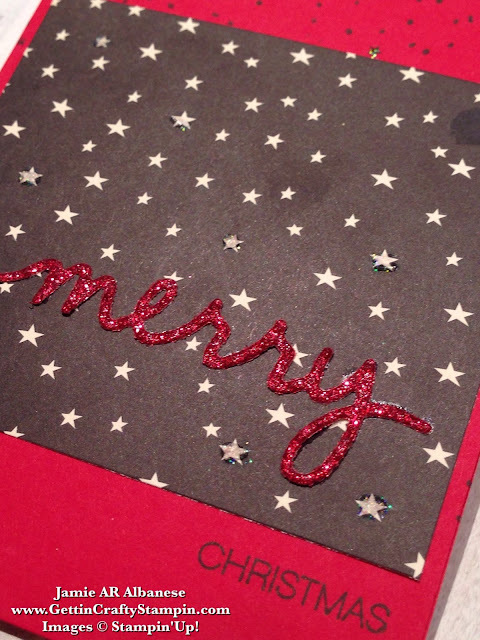 Die Cutting the Merry in our beautiful, sparkling Red Glimmer Paper for a wow look. The Christmas Greetings Thinlits are easy to use on our Big Shot Die-Cutting Machine and Magnetic Platform. Little bling.. when you have a pretty paper like this, the stamped stars from the Holly Jolly Greetings stamp set, your paper needs a little umph. Adding dashes of sparkle with the liquid Dazzling Details is a fun way to make the card look cohesive (and who doesn't love a little more sparkle??). Who knew that the holidays would sneak up so quickly! I remember welcoming in 2015.. and have barely gotten used to writing the date correctly (lol). Getting the most for my dollar, using up pretty paper and adding a wow accent like a red glimmered Merry, this hand-stamped Christmas Card makes me so happy! Join in on the holiday fun and create your own hand-crafted cards this Christmas at our card making classes - you are invited!